As she approached the shore of Sangatte, France, Florence Chadwick was exhausted. She had been swimming in the English Channel for over 16 hours, battling strong winds and thick fog that made every stroke a challenge. The previous leg of her journey, from France to England—which she had completed a year earlier—had been easy compared to this. But her effort would be worth it: When she finally arrived on French soil that day, September 11, 1951, she became the first woman to successfully swim round-trip across the English Channel. Born in San Diego, California in 1918, Chadwick discovered her love of ocean swimming at an early age. Her hometown offered her easy access to the beach, and she started competing in swimming races at 6 years old. She liked pushing herself to swim in difficult conditions: at night, in fog, and in strong winds. At the age of 10, she swam a two-mile race in the rough waters of Hermosa Beach, wowing the crowds. At 13, she earned second place at the U.S. national championships. After graduating from San Diego State College, she produced aquatic shows for the U.S. military, and in 1944, she swam with MGM’s water ballet star Esther Williams in the musical film Bathing Beauty. But Chadwick had her sights set far beyond Hollywood. As a child, Chadwick had been inspired by Gertrude Ederle, who, in 1926, became the first woman to swim the English Channel. Before her, women were considered incapable of such a long-distance swim. Ederle not only proved them wrong, but beat the men’s record by two hours. 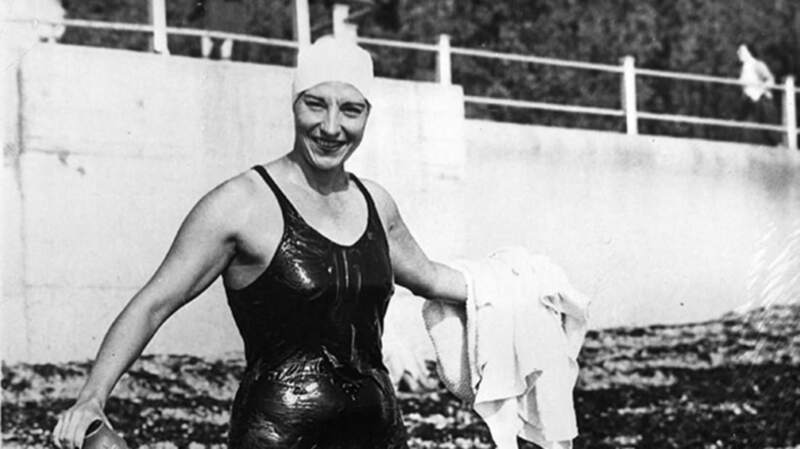 Chadwick became determined to be the first woman to swim the Channel round-trip—not just from France to England, as Ederle had, but from England to France. Swimmers and other experts considered the latter to be a more difficult crossing, in part because of the strong current pushing away from the shore. No woman had ever swum the England-to-France route successfully. Chadwick set a goal of swimming both Ederle's route and then back again, even if she had to rest in a bit between trips. After World War II, Chadwick took a job as a comptometer (a type of adding machine) operator with an American oil company in Saudi Arabia. She swam in the Persian Gulf before and after work and for up to 10 hours on her days off. After two years of rigorous training, she decided she was ready to make the first part of her Channel attempt—the trip from France to England, which Ederle had swum in 1926. On a chilly August morning in 1950, Chadwick dove into the water outside Wissant, France. She swam across the 21 miles of the Channel to Dover, England, accompanied by her father, friends, and authorities in a fishing boat. They kept an eye on her route and watched out for hazards, while she occasionally nibbled sugar cubes to keep up her energy. The trip took her a little over 13 hours—a world record for fastest swim across the Channel by a woman. "I feel fine,” she told reporters after crawling ashore in England. “I am quite prepared to swim back." But Chadwick ended up delaying the trip back across the Channel to France for over a year, waiting for more favorable weather and tides, and fattening herself up on a calorie-rich diet in preparation for the weight loss that comes with a long swim in cold waters. On September 11, 1951, despite dense fog and headwinds, Chadwick finally entered the water in Dover. The route to France was punishing, made worse by the fumes from an accompanying motorboat. But she completed the trip in 16 hours, 22 minutes—a world record. When she arrived, the mayor of Sangatte was there to shake her hand. Chadwick’s accomplishment made her famous. Back in San Diego, townspeople threw her a ticker tape parade. She appeared on TV shows such as What's My Line?, endorsed Catalina Swimwear, and was given a car by the city of San Diego. Although she had achieved her goal of conquering the Channel, it wasn't enough. Two months later, she finally succeeded, making the journey to Catalina in 13 hours, 47 minutes—two hours faster than the previous official record, set by a man. Chadwick followed up her Catalina swim with another trip across the English Channel from England to France in 1953, shaving several hours off her previous time. Later the same year, she swam across the Strait of Gibraltar between Spain and Morocco, as well as the Bosporus and the Dardanelles straits in Turkey, breaking records made by both men and women along the way. Although she achieved incredible success, Chadwick was also notable for her perseverance: She failed to complete swims, let alone break records, more times than she succeeded, not only in the Catalina Channel but in Lake Ontario and the Irish Sea. But she never let failure stop her. A pioneer, she demolished the notion that women were incapable of long-distance endurance swimming, and paved the way for other women to continue to break records in the sport. Even after retiring in 1960, she wasn’t content to rest. She opened swimming schools in New York and New Jersey, frequently coached young swimmers, lectured on the value of fitness, and worked as a credit counselor and stockbroker. In 1995, 25 years after she was inducted into the International Swimming Hall of Fame, Chadwick died of leukemia in San Diego. Fittingly, her ashes were scattered in the Pacific Ocean.